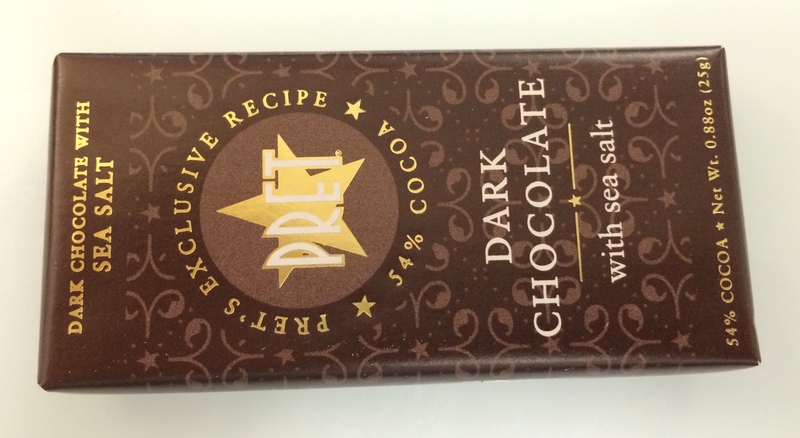 I stumbled upon Pret’s Dark Chocolate with Sea Salt during a quick lunch stop at, you guessed it, Pret A Manger, an seemingly successful urban lunch bistro despite having a name that people are only ever a little sure how to pronounce. – This bar definitely has more to offer to those who are chocolate melters than those who are chocolate chewers. – Very easy to break off a piece. Not that this is a revelation, but I was able to fracture it very accurately in terms of the size of piece I was looking to break off. – The salt is very subtle. But it’s perfect. Really. When you hit a little pocket of it, it’s smiles all around. – I would like them to sell these in stores. Approved. I would like to see a running discussion of the reemergence of salt as a featured ingredient in desert items. When did this start? Does it have anything to do with fracking? 2004. Your laboratory imported it and has procured. think the recipe has changed – the consistency / taste seems different? Less cocoa perhaps? 53% now – think it was higher before?